Be the first to share your favorite memory, photo or story of Andres. This memorial page is dedicated for family, friends and future generations to celebrate the life of their loved one. 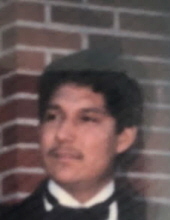 Andres V. Cortez, 56, of Florence, AZ passed away suddenly on April 7, 2019. He was born on October 4, 1962 in Mexico City to Antonia Magaña and Andres Cortez. Andres was a happy and joking around guy who never worried about anything. He enjoyed starting new projects, working on cars, hunting, dancing, and going to the lake with his family and friends. Andres started his own trucking company in 2005. He is preceded in death by his parents, and brothers Miguel Villicaña and Francisco Villicaña. Andres is survived by his wife of 28 years, Bertha Cortez, 5 children; Maria Cortez, Veronica Cortez, Andres Cortez, Jr., Cindy Cortez, John Cortez, brothers; Jose Villicaña, Eulogio Cortez, Jesus Villicaña ,sisters; Connie Villicaña, Amparo Villicaña, 6 grandchildren and many friends. A visitation will be held on Friday, April 12 from 1pm-4pm at Heritage Coolidge Funeral Home, a Rosary will begin on Saturday April 13 at 10am, Mass to begin at 10:30 at St. James Catholic Church. Burial to follow at Florence Cemetery. "Email Address" would like to share the life celebration of Andres V Cortez. Click on the "link" to go to share a favorite memory or leave a condolence message for the family.